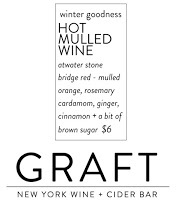 A warm mug of "winter goodness"
at GRAFT wine + cider bar. Although mulled wine is most commonly enjoyed in the fall and around the holidays, National Mulled Wine Day is celebrated on March 3rd each year. Dating back several centuries to medieval Europe, mulled wine has been an evolving tradition in many different cultures. There is a variety of recipes out there, but "mulled" simply means that the wine (which is traditionally red) is heated and spiced, making it the perfect treat to cozy up with in the winter. 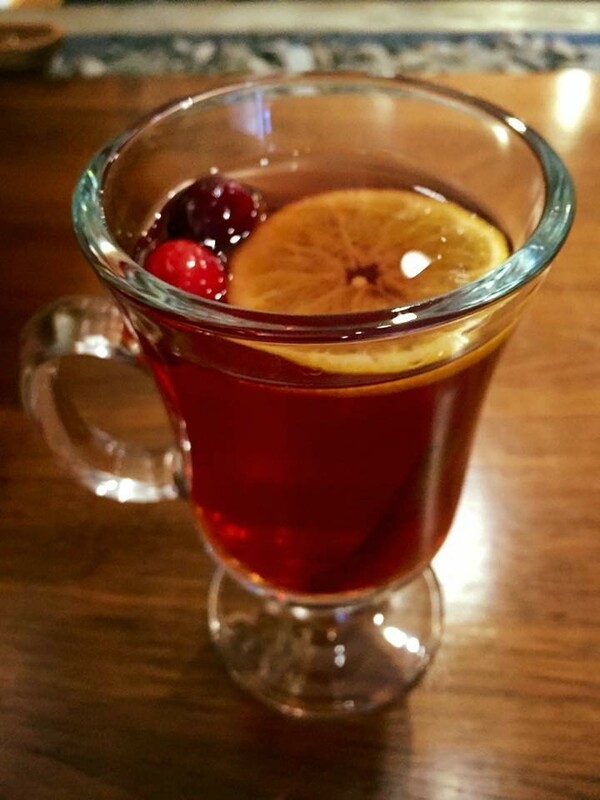 Warm up with a steaming glass of your own mulled wine and celebrate Finger Lakes-style! Located on the southeastern shore of Seneca Lake, Atwater Estate Vineyards has been serving up mulled wine in their tasting room for the past 13 years. Tasting Room Manager, Amanda Gumtow, created her own spin on glühwein (a German mulled wine) with wines from Atwater&apos;s Seneca Sweet Series, and visitors loved it. Stop in to the tasting room during the weekend to taste it yourself or pick up Mandy&apos;s Magical Mulled Wine kit (available year-round in the tasting room and online) and create your own mulled wine at home. Open for business in the fall of 2015 in downtown Watkins Glen, GRAFT is the area&apos;s only New York focused wine + cider bar, and the newest place to enjoy a warm mug of "winter goodness." Mulled wine is offered regularly on the menu, but GRAFT also experiments with different recipes all the time. Mandy&apos;s Magical Mulled Wine Kit is also available for purchase at GRAFT and the kitchen offers creative, locally-sourced cuisine to pair with your mulled wine. Enjoy a fun twist on traditional mulled wine at Barnstormer Winery, which Tasting Room Manager, Kyle Knapton, says "tastes just like a liquefied candied apple!" Created with wine from Barnstormer and fresh, local apple cider from Wager&apos;s Cider Mill in Penn Yan, this "winter sangria" concoction is great for family gatherings and parties. Barnstormer&apos;s tasting room on the west side of Seneca Lake sells recipe cards along with their homemade spice packets, and also offers tastings of their "Candied Apple." Combine ingredients in a crock-pot and set on low for a couple hours before serving. The longer it sits, the more the spices will steep. Do not allow to boil. Heat in crock-pot on low. Do not boil or use an aluminum pot for heating. 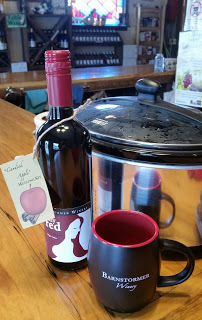 Glenora&apos;s tasting room on the west side of Seneca Lake only serves mulled wine in the fall, but mulling spices and wine are available all year round! Pour the bottle of Jammin&apos; Red and the water into a large crock-pot. Turn the crock-pot to high and place the spice bag into the mixture (Do not cut open the spice bag. Leave contents in the bag, similar to a tea bag). Let the wine mull for about two hours, but make sure it does not boil. When it is finished mulling you will be able to really smell the spices and the color will be reddish brown. At this point, remove the spice bag and turn the crock pot to warm. Add light brown sugar to taste. Stop in to Fulkerson&apos;s tasting room on the west side of Seneca Lake to pick up a bottle of their Vincent and some mulling spices, available year-round in the gift shop, to concoct your own mulled wine at home. If you&apos;re feeling really ambitious, Fulkerson also offers 30 varieties of fresh grape juice and home winemaking supplies to help you start from scratch! 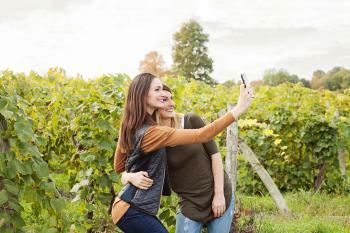 Click here for a full list of wineries to enjoy in Finger Lakes Wine Country.